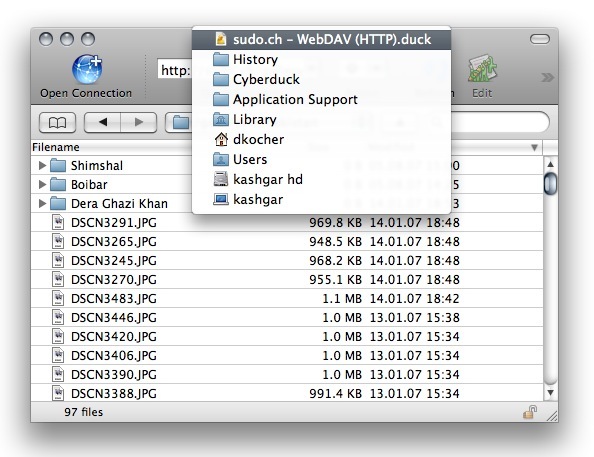 The next major release of Cyberduck will support WebDAV. WebDAV, an acronym for Web-based Distributed Authoring and Versioning, is described as “…a set of extensions to the HTTP protocol which allows users to collaboratively edit and manage files on remote web servers”. Although, the Finder.app does support WebDAV, first comparative tests show performance is much better in Cyberduck and browsing feels snappier. 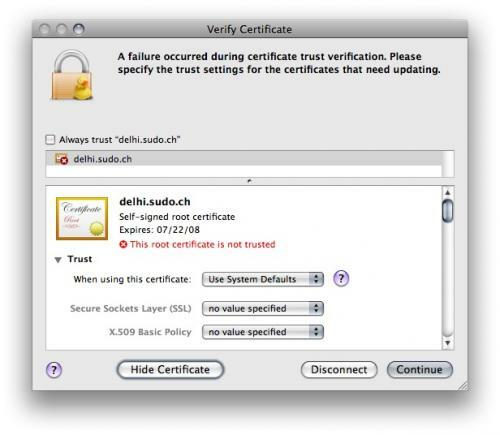 Because .mac is based on WebDAV, it will also be possible to access your iDisk using Cyberduck by mounting the URL http://idisk.mac.com/membername as described in this support document. Cyberduck 3.0 is expected to be released later this next month. The current nightly build (use with caution) is available for testing. 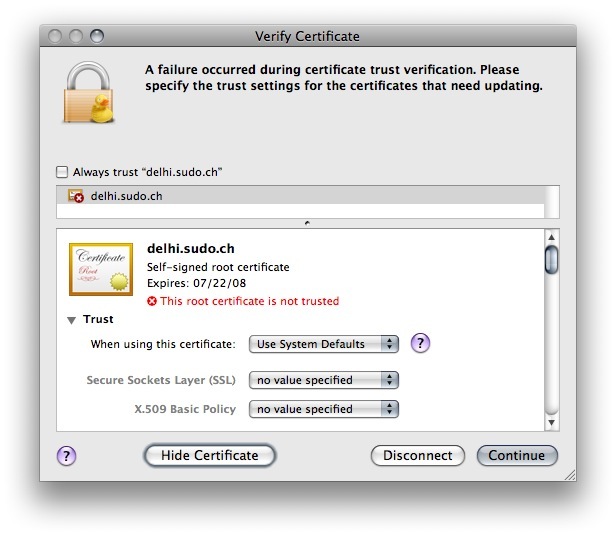 Continuing the series about new features in Cyberduck 3, which started with the Amazon S3 support announcement, I want to highlight a change to the user interface: Since Cyberduck has been available in 2003, it featured a drawer – the new user interface widget introduced with OS X 10.0 – to display the bookmarks. I have decided to change this in Cyberduck 3 and replace it with a ‘inline’ bookmark window as e.g. in Safari. Status. Shows a green bullet if the browser is connected to the remote host. Search. The filter field you are used to in the browser allows to search within the bookmarks, too. It filters the bookmarks with the search string matching either the nickname or hostname. History & Bonjour. 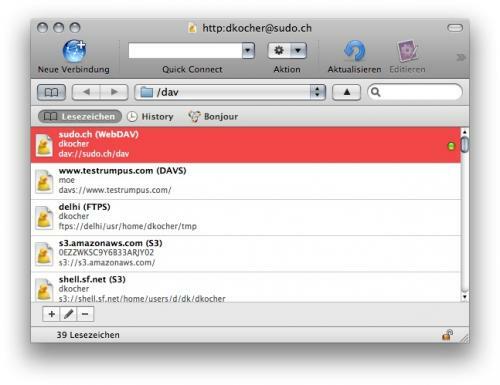 A navigation bar at the top allows to select recent connections and to connect to remote hosts discovered via Bonjour/Zeroconf. Cyberduck 3.0 is expected to be released later this month. The current nightly build (use with caution) is available for testing. 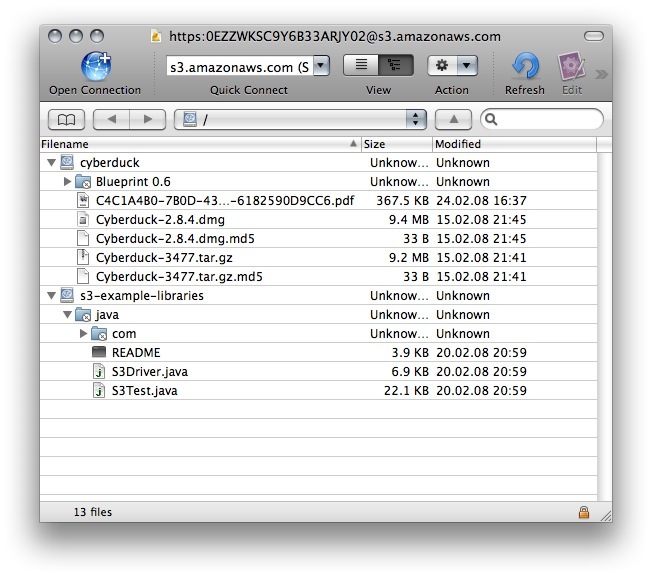 The next major release of Cyberduck will support Amazon S3. I have integrated the excellent open source library JetS3t into Cyberduck. It allows you to transfer files to your S3 account and browse the S3 buckets and files in a hierarchical way as you are used to with other remote file systems supported by Cyberduck.